As the Panama Canal celebrates its centennial, it has the "divided" attention of countless U.S. and global interests hoping to share in its fortunes. In the eight years since Panamanians passed a referendum to modernize the Panama Canal, there has been endless speculation about how an early 20th-century engineering marvel might shake up the future of global trade. The addition of a third set of locks, and further deepening along the waterway, will increase vessel capacity from 4,500 to 14,000 TEUs while allowing another 2,000 transits annually—in effect turning the spigot on trade flows moving between the Pacific and Atlantic oceans. The end game for U.S. shippers and consignees is nebulous at best. But a number of current trends and trade dynamics add new color to the Panama question. Recurring labor strife on the West Coast, congestion concerns, equipment shortages, a sluggish ocean shipping industry, and nearshoring pose different quandaries. "The Panama Canal situation has existed for some time," says Curtis Foltz, executive director of the Georgia Ports Authority. "Many shippers have diverted incremental freight to the East Coast as risk mitigation against the congestion issues and labor contract discussions at West Coast ports. Clearly, shippers are concerned about capacity in the short and long term." For all the speculation surrounding the Panama Canal's impact on Asia-to-U.S. trade flows, there has been a virtual Gold Rush in infrastructure development along the Southeast Atlantic coast. Florida interests, in particular, have staked a claim to bring more Asia all-water volume into the country via the South Florida ports strategy. As the West Coast labor situation continues to unsettle shippers South Florida is minding its own business. 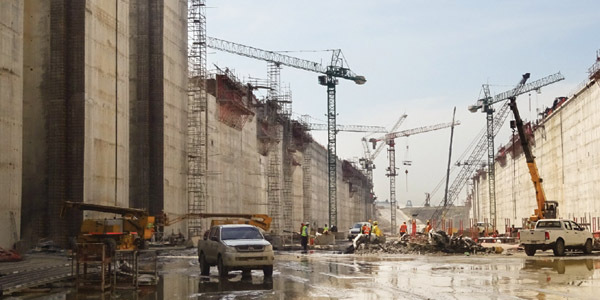 The state at large has made a concerted effort to invest in and develop infrastructure that will capitalize on the swell in volume expected through the Panama Canal after its expansion is completed in early 2016. Jacksonville-based Florida East Coast Railway (FECR) has been the catalyst for much of the action along the I-95 corridor. Running 351 miles of track between Miami and Jacksonville, the railroad is a lynchpin in not only moving intermodal freight in and out of South Florida, but also coalescing support for infrastructure development. Over the past several years, Port Everglades, PortMiami, and FECR have been working in concert to attract funding for various projects in South Florida. Their efforts have become a model for public-private collaboration. Port Everglades, for example, opened a new, 43-acre ship-to-rail yard in July 2014. The Intermodal Container Transfer Facility will mitigate some long-standing congestion issues in the area while increasing intermodal lifts from 100,000 to 500,000 per year, greatly improving throughput on and off port. More notable is the funding mechanism that made the project a reality. The state kicked in $18 million; $20 million came from Broward County; and FECR contributed $35 million—$30 million of which came from a state infrastructure loan. Miami has seen similar collaboration. The port received $23 million in federal TIGER grant funds to upgrade on-dock rail infrastructure. FECR contributed $9 million, Miami-Dade County $5 million, and the state Department of Transportation allocated $9 million from its coffers. PortMiami is also dredging its channel to 50 feet at a cost of $77 million—money that Governor Scott appropriated from the state transportation fund when he was first elected. Then there is the $1 billion plus that was apportioned by Miami-Dade County, the city of Miami, and the state to construct the recently completed PortMiami tunnel. The new underpass discharges truck traffic on and off port directly from Interstate 95, thereby circumventing downtown Miami traffic. So when FECR President and CEO Jim Hertwig talks about the South Florida ports strategy, there's a tangible connection between the different public and private stakeholders. Speaking at the November 2014 RailTrends conference in New York City, Hertwig recounted a recent trade mission to Asia, where he met with many major steamship lines. "There was a lot of interest in the South Florida solution—keeping in mind that we will have deep water by 2016," he shared. Beyond Florida's proximity to the Panama Canal, it's a consumption market brimming with potential. About 13 million people live in Central and South Florida alone. Now that FECR has on-dock capabilities at both PortMiami and Port Everglades, it can run north to its Cocoa ramp and deliver into Orlando, which is 30 miles away. That's a 200-mile intermodal haul. This advantage allows the railroad to compete with over-the-road trucking that previously came out of the South Florida ports, Jacksonville, and even Savannah. For every four 53-foot intermodal containers that move south into Florida today, only one returns captive—such is the supply and demand dynamic in a heavily service- and consumption-oriented state economy. But it means there is ample incentive and scale to level that imbalance by pulling new volume through the Panama Canal and South Florida ports.